The village pub is often the centre of village life and the Star & Garter has been serving the community for the last 300 years. Currently owned by the Charles Wells Brewery, it continues the traditions of village pubs. It is now the only public house in the village, but it used to have competition from the Fitzwilliam Arms, the Chelveston Working Mens Club and an off-licence. The Star & Garter was owned by the Lords of the Manor during the late 1800's and leased to Pickering Phipps & Co of Northampton until they purchased it around 1928. The Phipps Brewery Co and tied houses were acquired by Watney Mann in 1968. More recently, it was purchased by Charles Wells in the 1980s, from a Mr Verani, a millionaire property speculator, who had purchased it from Watney Mann during the sell-off of the tied houses. A survey of the buildings, undertaken by James Looker as an archaeology student at Leicester University in 2002, dates the earliest parts of the buildings back to around 1650 (the area now the restaurant which was once an adjoining cottage). The main bar area dates from around 1700, whilst the later rooms date from around 1840. Up until 1946, it only had a 6 day license. It wasn't until Phipps brewery Co closed the Station Hotel, Grendon, when they transferred the license to the Star & Garter, that it could open all week! 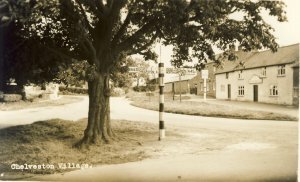 Postcard approx 1930 showing the Star & Garter from Raunds Rd. By kind permission of the late Maynard Baxter. 1737 John Hawkes, John Robinson & Anthony Fletcher.